Series of Weapons of the World pocket reference books. Based on open information sources, the reference book supplies basic data on 150 most significant combat ships and boats built by major maritime powers or with their direct assistance. His book is recommended to military and civilian experts in shipbuilding, analysts and journalists as well as all those interested in naval matters. Illustrations: photo on the book cover and in the text by courtesy of Russian and foreign companies and organizations. Design and computer aided makeup by llya Britkin. This book opens a series of Weapons ol the World pocket size reference books being published by the ARMS-TASS Information Agency. The reference books are intended primarily for those experts of Russia's defense companies who use the services of the ARMS-TASS Information Agency. Also, the books will be useful to many of those interested in the world's arms and military hardware. 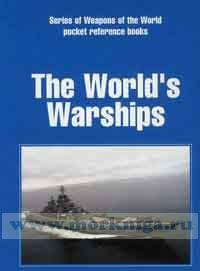 The World's Warships reference book supplies data on the newest ships in twelve main classes: SSBN, SSN, SSK, midget submarines, aircraft carriers, cruisers, destroyers, frigates, corvettes, combat boats, minesweepers and landing ships. Their service lite ends after 2010. The ships were chosen based on the following criteria: service life, significance, novelty of design decisions, the ship's belonging to the navy of a leading maritime power or her construction by that country's shipbuilding industry. That is why many fairly new combat ships and boats of some Asia-Pacific, African and South American countries were not included in the book as insignificant in terms of armament and technical equipment. Nor were ships and boats included if they were replicas. The book considers all nuclear submarines, all new non-nuclear submarines, all aircraft carriers, practically all new cruisers and destroyers, most of new frigates and only essential types of corvettes, combat boats, minesweepers, and landing ships and boats. Some cases consider some countries' ships built under transnational projects if each of those countries built them with substantial differences. The ships in the book are grouped together based on their classes. Inside the classes they are grouped as per developer countries and producers of the ships. Presented are a total of 150 types of combat ships and boats designed and built in 18 countries across the globe: 10 SSBN, 13 SSN, 14 SSK, 3 midget submarines, 13 aircraft carriers, 4 cruisers, 23 destroyers, 30 frigates, 10 corvettes, 6 combat boats, 8 minesweepers, and 16 landing ships and boats.